I’m at about 10% of body fat in the above right picture. The picture on the left was taken 4 years before the picture on the right but I started training and dieting for six pack abs approximately 2 years after the first picture was taken. It took me 2 years of training and dieting to finally get a visible set of six-pack abs. I didn’t spend the whole 2 years strictly dieting and training, mind you. 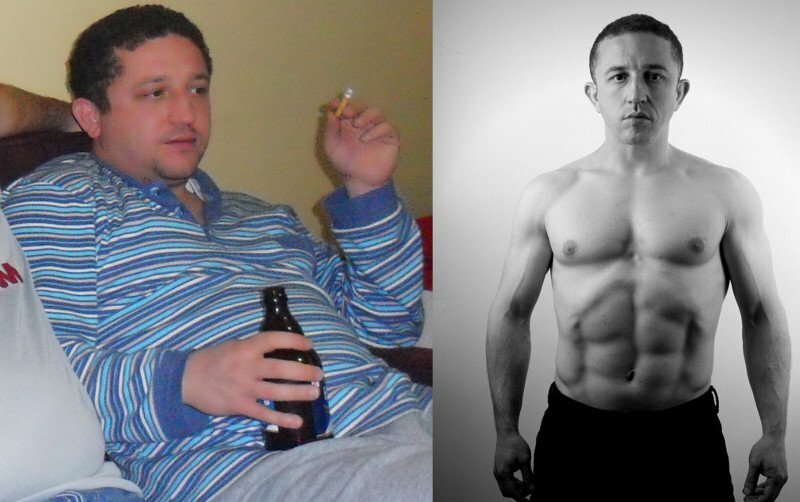 I lost a lot of time with trials and errors with both training and dieting. I also changed cities and countries, ignored my training and dieting for extended periods of time in favor of drinking and partying. When I finally nailed down both diet and training, stopped drinking beer, and maintained my diet/training discipline for a consecutive 4 months, I finally got the six-pack abs that I so desired. I don’t want you to make the same dieting and training mistakes I made so that you can claim your six pack abs faster than I did. How long it will take you to get six pack abs depends on your athletic history, current body fat percentage, and how willing you are to train hard. If you have a solid history of rigorous training then you are more likely to get your abs faster and less likely to quit training when the going gets tough. The rest of the article will focus on regular men who don’t have a meaningful athletic history. If you have an athletic history and you are in decent shape then you’ll get your six pack abs in a matter of a few months provided that you get your training and diet right. If you don’t have an athletic history you will find out how fast you can get six-pack abs in the following sections. Find out your current body fat percentage. Find out your estimated daily calorie expenditure and the calorie deficit you can create depending on your body fat percentage. Review the examples below for an estimate on how long it will take you to get abs. The higher your current body fat percentage is, the longer it will take you to get six pack abs. For a visible set of six-pack abs, you must be at around 8-10% of body fat. It’s not normal to be at these low levels of body fat unless you are already an athlete. If Wikipedia is correct, the average body fat percentage for men is 18-24%. There are many ways to measure your body fat percentage ranging from the cheaper option of a fat caliper to the expensive option of a DEXA scan. Learning your exact body fat percentage isn’t worth obsessing over, though, as referring to the following picture will give you a good enough estimate on where you are currently standing body fat percentage-wise. Take a full body picture of yourself and compare it to the above image to have a good estimate of your current body fat percentage. You can keep referring to the same image to check your progress as you keep shedding body fat. If your current body fat percentage is above 10% then you will have to lose body fat. The only way to lose body fat is to eat fewer calories than you burn1 2. Go to this page and enter your gender, age, weight, height, and activity level to find out a fairly accurate estimate of your daily calorie expenditure. Choose “moderate exercise (3-5 days a week)” for your activity level as I recommend you to train 4 times a week for building muscle. If your starting body fat percentage is high you will lose fat faster at the beginning. It will get slower and harder to lose body fat as you keep getting down to lower levels of body fat. As this article is about how long it takes to get abs, I won’t dive into the details of a six pack diet. But don’t worry, I got you covered. Here’s my article which goes into great detail about dieting for six-pack abs: Dieting for a Six Pack: What and How to Eat to Get 6 Pack Abs (with sample diet plan). 200 X 0.3 = 60 so this man has a total of 60 pounds of fat in his body. The remaining 140 pounds is his lean mass. If he trains and eats right, he will have six pack abs when he has a total of 17 pounds of body fat and 153 pounds of lean mass (10% of body fat). So he must build 13 pounds of muscle (by training) and lose 43 pounds of body fat (by a combination of dieting and training). 1 pound of fat contains 3,500 calories. So, 43 pounds of fat contains 150,500 calories. He started with 30% of body fat so he’s creating a 600 of a daily average calorie deficit at the beginning which will dwindle to 250 calories a day when he gets down to 13-14% of body fat. Since he will spend more days in lower body fat levels as he will lose fat faster in the beginning, this man will create an average of daily ~350 calorie deficit during his six pack journey. 150,500 divided by 350 equals to 430 days, so it will take this man 1 year 2 months and 4 days to get six pack abs assuming that he does everything right. 180 X 0.2 = 36 so this man has a total of 36 pounds of fat in his body. The remaining 144 pounds is his lean mass. If he trains and eats right, he will have six pack abs when he has a total of 17 pounds of body fat and 153 pounds of lean mass (10% of body fat). So he must build 9 pounds of muscle (by training) and lose 19 pounds of body fat (by a combination of dieting and training). 1 pound of fat contains 3,500 calories. So, 19 pounds of fat contains 66,500 calories. He started with 20% of body fat so he’s creating a 400 of a daily average calorie deficit at the beginning which will dwindle to 250 calories a day when he gets down to 13-14% of body fat. Since he will spend more days in lower body fat levels as he will lose fat faster in the beginning, this man will create an average of daily ~300 calorie deficit during his six pack journey. 66,500 divided by 300 equals to 221 days, so it will take this man 7 months and 7 days to get six pack abs assuming that he does everything right. 165 X 0.15 = 24.75 so this man has a total of 24.75 pounds of fat in his body. The remaining 140.25 pounds is his lean mass. If he trains and eats right, he will have six pack abs when he has a total of 17 pounds of body fat and 153 pounds of lean mass (10% of body fat). So he must build 13.25 pounds of muscle (by training) and lose 7.75 pounds of body fat (by a combination of dieting and training). 1 pound of fat contains 3,500 calories. So, 7.75 pounds of fat contains 27,125 calories. He started with 15% of body fat so he’s briefly creating a 300 of a daily average calorie deficit at the beginning which will dwindle to 250 calories a day when he gets down to 13-14% of body fat. Since he will spend more days in lower body fat levels as he will lose fat faster in the beginning, this man will create an average of daily ~260 calorie deficit during his six pack journey. 27,125 divided by 260 equals to ~104 days, so it will take this man 3 months and 12 days to get six pack abs assuming that he does everything right. Can You Get Six Pack Abs Faster? 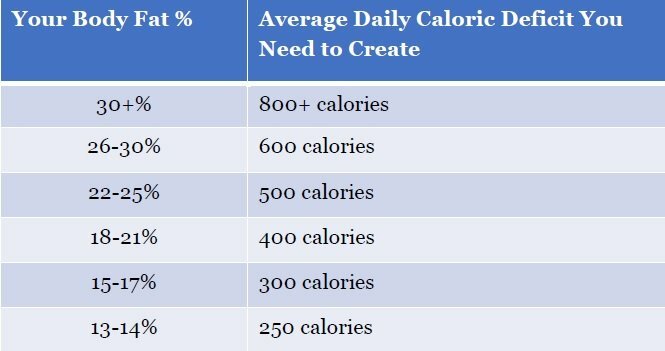 The average daily calorie deficit numbers I advise you to create corresponding to your body weight percentage are pretty conservative numbers. I kept these numbers conservative because while you can lose fat faster by creating a larger calorie deficit, keep in mind that you will go through a rigorous training when you are in a state of a constant caloric deficit. A conservative calorie deficit will provide you with the energy to plow through your rigorous workouts. Once you build your muscles, they stay with you for a lifetime thanks to muscle memory. If you lose your muscles due to a lack of training for extended periods of time in the future, you can get them back rather quickly by taking advantage of muscle memory. By getting six pack abs you will master how the fat loss game works so that you can take advantage of your hard earned knowledge whenever you need to lose body fat. Getting six pack abs might take longer than you think but you will start to look great within 5-10 weeks as you will build muscle quickly, thanks to a phenomenon called newbie gains. It took me 2 years to get my six pack abs but people had started complimenting my physique when I was only 5 weeks into my training. It doesn’t take a long time to build a body you can be proud of. Keep in mind that it will be easier to create a caloric deficit after you power your way through the first 5 weeks of training and build a noticeable muscle mass, as muscles help you burn more calories even at the times when you are not training3. Additionally, you can accelerate fat loss and get your abs faster by creating a larger caloric deficit than I recommend. If you have the iron will to sustain a larger calorie deficit for an extended period of time while simultaneously training hard then you will get ripped faster. The right way to train for six-pack abs is no different than the right way to build muscle. As your body is a whole unit and your muscles work together, full body workouts are the way to go. I recommend bodyweight training for getting six pack abs not only because bodyweight training is an excellent way to start building muscle, it’s also more than enough for getting six pack abs. I built my six pack abs by training less than 3 hours a week, without stepping foot into a commercial gym. I’ve done the majority of my workouts at home which came handy because I didn’t have the time to lose in traffic, driving back and forth to the gym. I always believe in the power of simplicity so you will never have to deal with any exercises with steep learning curves. The good old burpees, push-ups, pull-ups, sit-ups, squats, lunges, jumps, and leg raises are all the exercises you will ever need to get ripped abs. These compound movements are simple yet powerful. They are more than enough to train your whole body and build you the six pack abs you want. 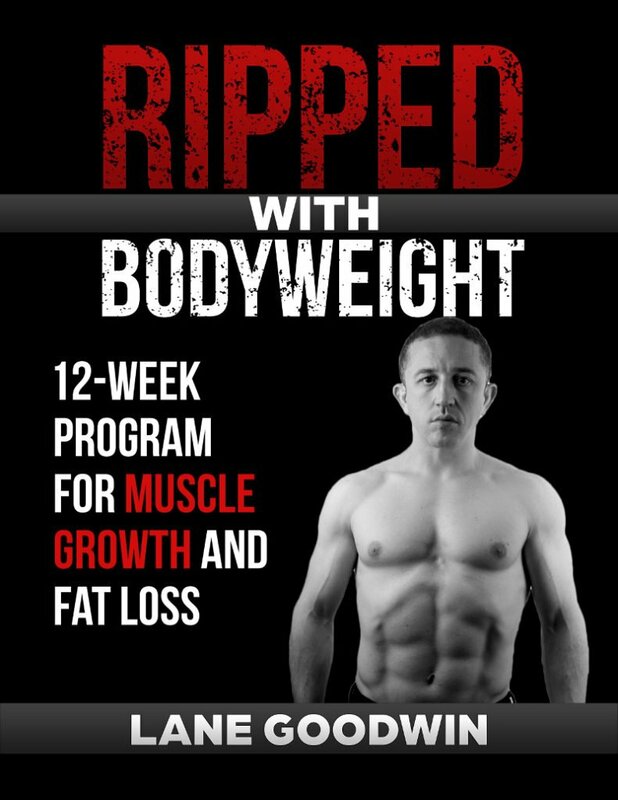 Check out my article How to Get Six Pack Abs Fast for further information on training for six pack abs and feel free to check out my book Ripped with Bodyweight for my bodyweight training routine. A fat loss plateau is where you keep eating at a caloric deficit but the fat is resisting to come off. As fat loss will not always be linear, fat loss plateaus for 1-2 weeks should be expected. However, if a fat loss plateau persists for more than 3 weeks then you will have to take some measures in order to keep losing fat. Stubborn fat is the last bit of fat that’s refusing to melt away, right before you fully unearth your six pack abs. It’s unlikely that you will have to deal with stubborn fat provided that you follow my training methods because your ab muscles will be big enough to be fully visible even before the stubborn fat burns off. Temporarily increase the calories you eat. Forget about the caloric deficit for a while and eat at maintenance or slightly above maintenance levels for 2-4 weeks. This will restore your metabolic rate. You should resume losing fat when you go back to eating at a caloric deficit again. Calorie cycling. Let’s say you are eating 2000 calories a day to create the calorie deficit you are targeting. For calorie cycling, eat 2600 calories one day and 1400 calories the next day. You will still be eating an average of 2000 calories but the 2600 calorie days will help speed up your metabolism which will help you get past your fat loss plateau. Weight loss plateaus and stubborn fat issues might prolong the time it takes you to get your six pack abs but that’s life. Sometimes it’s not a fat loss plateau or a stubborn fat issue but it’s your body retaining water. Temporarily reducing your sodium intake or taking mild diuretics such as dandelion root will help you to lose water weight. I found that water retention is rarely the case though. When you are eating at a caloric deficit and the fat is refusing to come off, you want to believe that you actually burned the fat and the extra weight is just water retention. It’s kind of a wishful thinking. Try the water retention remedies I mentioned above but don’t bet on them. While it was no easy feat to accomplish, getting six pack abs was one of the best decisions of my life. Benefits of getting six pack abs are well-worth the effort and you start enjoying many of the benefits long before you are six-pack abs lean. I don’t see a reason why you shouldn’t start putting in the effort now as you’ll reap all those great benefits for a lifetime. PS – Ripped with Bodyweight is how I got my six pack abs. Follow it and you might do the same. How Do People Get Fat Without Making Noticeable Changes to Their Diets?